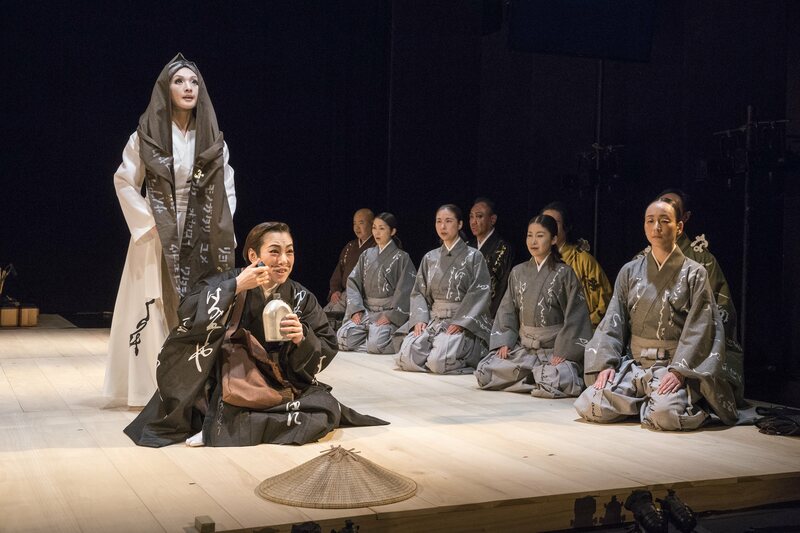 From Jan. 11-14, director Satoshi Miyagi and his company Shizuoka Performing Arts Center (SPAC) returned to Japan Society of New York with their sold-out production of Mugen Noh Othello. As with their previous Madea (seen at Japan Society in 2011), Miyagi and company adapt a classic play from the Western canon and infuse it with the stylistic conventions of noh. Specifically, Miyagi and his playwright Sukehiro Hirakawa re-tell the story from the viewpoint of Desdemona’s ghost, a traditional in the mugen (supernatural) style of noh. This style typically involves otherworldly beings, including gods, spirits and ghosts. Time is often depicted as passing in a non-linear fashion, and action may switch between two or more timeframes from moment to moment, including flashbacks. Noh theatre is considered to be the highest art form among the five classical Japanese forms of theatre: noh, kabuki, bunraku, butoh and kyogen. The art form requires highly trained actors and musicians (Mugen Noh Othello featured a percussion ensemble of six). The actors usually wear masks to signify the characters’ gender, age and social ranking, and by wearing masks the actors may portray youngsters, old men, female, or even nonhuman characters such as demons or animals. Noh also contains a uniquely structured stage with the hashigakari, a narrow bridge that is used for entering. Since Japan Society’s theater contains a more conventional stage (albeit without proscenium), the hashigakari has been approximated. All actors enter through it, as if entering from another space into the new shared theatrical space with the audience. Throughout the performance, the actors chant in unison, further accentuating the otherworldly atmosphere. Overall, this production utilized these elements in effectively portraying the story of Othello from Desdemona’s point of view. More specifically, the production focuses on the moment that she is killed: it’s as if she’s permanently trapped in a moment in time once her body leaves this world. This suspended instant haunts the evening as she recounts the story of her love for Othello, his subsequent jealousy and her eventual murder as a result of that jealousy. Desdemona feels most passionately drawn to Othello at this moment, for his rage is an expression of his love for her. This paradox lies at the heart of this adaptation as Desdemona leaves on a hopeful note of redemption of hope in the afterlife. In Shakespeare’s text, these events unfold through the action on stage. Here, it is delivered in the hypnotic chanting that defines noh. 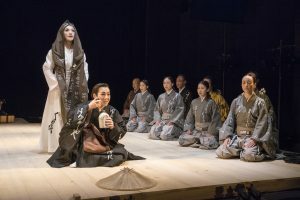 The supernatural elements of Mugen Noh Othello highlight some of the more mysterious elements of Shakespeare’s tale, particularly Othello’s jealousy (“the green-eyed monster”) when seeing the mysterious handkerchief. In this striking setting, the noh theatrics perfectly capture and complement the emotions and thoughts recurring in Shakespeare’s play. For upcoming events at Japan Society, visit www.japansociety.org. 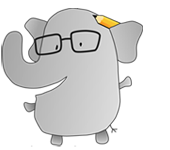 For more JQ reviews, click here.